Most things on this planet go through similar phases over their lifespans. Be born, grow, thicken, shrink, die. With a few variations depending on the subject, that is true. Humans for example. Not every individual gets wider in its adulthood. Some stay fit and slim forever as if time became still, while others are already overweight shortly after learning how to walk. Or trees, which skip the shrinking stage. They usually grow fast as hell until they reach an opening on the forest canopy, and then switch mode and start beefing up to defend their turf against the competition, continuing that way until disease or fire stops them, or until being toppled over by a wind storm. Rivers are another example, although some leeway is required to make the comparison. They are fast and agile when young, slow down in their prime as they gain water from tributaries, and finally wander aimlessly through meanders before finally disappearing in the ocean. And then come glaciers, or rivers of ice. They are created when more snow accumulates in the winter than melts away in the summer. If that happens, snow starts to accumulate year after year, slowly turning into ice by the sheer weight of the snow on top of it. This is not a glacier yet though. Just ice. We can also call it a glacier waiting to be born, a glacier embryo. And here gravity comes to the rescue. Yes, gravity, pulling everything down. Sooner or later, that ice will start to flow down, even if the slope is small. Even if it is extremely small. But it will flow down no matter what. Sometimes the ice may need to grow a lot before starting to flow, but flow it will. And then it is not an embryo anymore. A glacier has been born. Once in motion, it is time to grow. Downhill. The lower it gets, less snow it gets in the winter, and more melting it suffers during summer. At some point it will find balance, adding ice above a certain altitude, and losing it below. Our baby glacier has grown up and become a full grown glacier. Time to mature now, to thicken up. Although in this case it depends on the climate. Cold, precipitation, and cloud cover are the glacier equivalents to peanut butter for humans or thunderstorms for rivers. The more they get, the thicker they grow. And not unlike ourselves, glaciers can go through several cycles of dieting and beefing up, only at a much longer timescale, slowly following the climate variations. At some point, the climate conditions become too harsh for the glacier to hold its ground. It may be too warm, or too dry, or too sunny. Either way, time to shrink. If these conditions persevere, sooner or later the once mighty glacier will run out of ice, out of blood, die, and disappear. That is how it works. Or so I thought. Until I found this one. A small glacier by any means. So small it does not even appear on maps anymore. 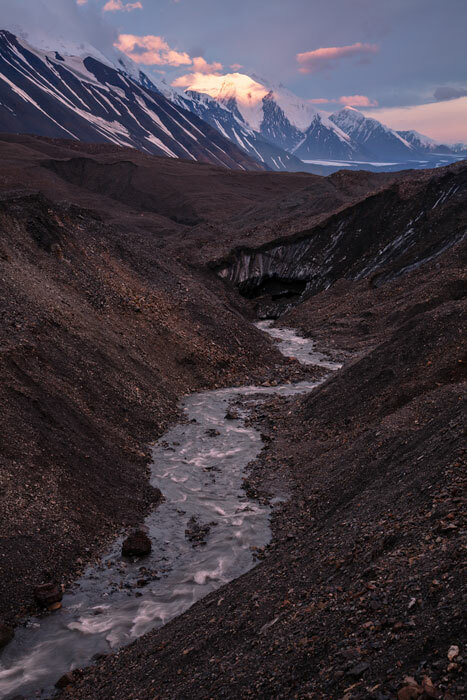 It was probably two and a half miles long a few hundred years ago, a minor tributary to the mighty Muldrow Glacier, which even today flows north for over thirty-two miles from Denali, the highest mountain on North America. I was slowly climbing this valley, concentrated on finding the best route through the tons of debris and rocks of all sizes that made up the valley floor. This is the material that glaciers carve from the mountains that flank their course, the material moraines are made of, the material they leave behind after dying. Had been climbing for at least a couple of hours. Then a creek appeared, not on the valley floor, but parallel to it several hundred yards to its right. So I looked back to find out where did all this water go. It turns out it went below the ice. Below the same ice I had been walking on without knowing it. Below the remains of the glacier that used to flow down this valley. That still covers most of it, but does not flow any more. A glacier in decomposition. So it turns out that some glaciers do have an extra stage in their lives. Decay. I continued climbing and spent the night on top of Anderson Pass, with incredible views of both sides of the Alaska Range. One of the most beautiful places I have ever put my tent on. And also one of the more exposed. Unlike the previous days, conditions were perfect when I went to sleep. No wind and no rain. Could not believe it. At last. Neither could I believe it when I woke up four hours later. Icy rain and what sounded like gale force winds to me. Got up, managed to put my soaked tent inside my backpack without neither the tent nor myself being blown away, and headed down as fast as I could. Down towards protection, down towards safety. A couple hours later I passed by the point where I had stopped the previous day on my way up. Just as the clouds opened up and the early morning sun hit the very top of Denali, more than 20,000 feet high and thirty miles away.